Hello, hello!! Happy Hump Day, everyone! Only two days until Friday. TWO DAYS! We can make it. I KNOW WE CAN. 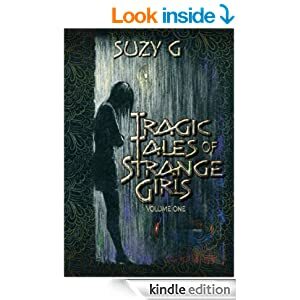 And speaking of Friday, last Friday, I posted my review of Tragic Tales of Strange Girls, Volume One, and today, I've got a little author interview to share with you! YAY FOR AUTHOR INTERVIEWS. You're gonna love it, guys. I swear. Suzy G is awesome sauce! Picture from Suzy G's website. Raise your hand if you're shocked that this gal wrote some über creepy short stories. Yeah...that's what I thought. Ha! Okay, time for the interview to begin! 1. Short stories are a very specific beast. And by that, I mean they’re mega hard to write. Or, at least, they’re mega hard for me to write because you need to do a WHOLE LOT in a very small space, so I’m curious as to how you got into writing short stories. Have you always written them? If not, what led you down the short story path? I grew up reading short stories by Stephen King and Ray Bradbury. I love short stories. You get in, you get punched in the feelers, you get out. There’s no room for a whole lot of filler. The short story is a natural feeling length for me. Everything in the story--the voice, the conflict, the prose--is concentrated and heightened. I love trying to make it all fit. There is a special beauty in brevity. 2. I’ve described Tragic Tales as “creep-tastic,” because the stories are creepily fantastic (and hybrid words are awesome). On social media, I’ve never gotten the impression that you’re a creepy kind of gal. I mean, you’ve got partially pink hair! Where does all your creepy inspiration come from? 3. I’ll admit that I’m a scardy-cat and there were two stories, in particular, that gave me the prolonged heebie-jeebies. Did writing any of the stories keep you up at night? No. My mind is a tangled ball of anxiety all the time. My imagination is always constructing some sort of terrible scenario that will probably happen AT ANY MOMENT. By the time I really think about things and get them down on paper in story form, that scenario is no longer scary to me. 4. Although there is a very consistent theme in Tragic Tales (the theme being tragedy), did you always have that specific theme in mind? And what made you choose these particular stories for Volume One? It wasn’t intentional, but at some point I realized that I’d amassed quite a few stories with a couple things in common: they were written from a young girl’s POV and they ended rather unhappily. Again, that seems to be a natural feeling thing for me when I sit down to write. I know what it is to be a young girl in seemingly hopeless situations, feeling pretty powerless. Sometimes writing can exorcise all kinds of demons. Horror, for me, is pretty cathartic. 5. Quick! Zombies are attacking your house! You only have five minutes to grab what you can. What do you take? Wow. What was I saying about always imagining worst case scenarios? See, guys? I told you that Suzy G was awesome! And I guess she's not as creepy in real life as you may have thought, based on my review. Phew! *wipes brow* Haha! And the fact that Suzy's zombie weapons of choice would be "a claw hammer and good old-fashioned denial," makes me love her even more. So go buy her collection of short stories RIGHT NOW! Look, I'll even make it easy for you. Just click on the cover to get linked to Amazon! And if you want to have more Suzy G in you life (because, you know, why wouldn't you?) here's list of where you can stalk hang with her. Thank you so much for the interview, Jennie! And for the inappropriately dancing toddler at the top. I couldn't have asked for better gifs. :) You da bomb.